There were over 30 of us at my mom's for Easter. We always have fun, but the best time of the day is the egg hunt. We adults have finally given up the hunt and leave it to the little people. 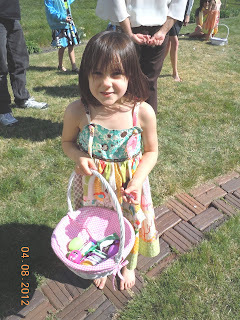 Here is Natalie with her basket of goodies. 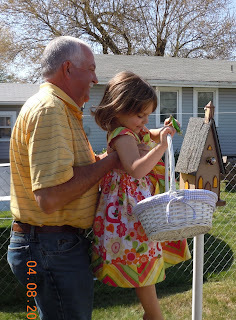 Lizzy got a little help from poppa reaching the higher up eggs. Jack took some time out to taste some of his loot. Check out the other captures at Beth's. It looks like you had a great day for an egg hunt! Beautiful lilac -- I can almost smell it from here! Lovely pictures. You have such pretty baskets too. It looks so much fun. I miss having little kids for the holidays. I love your fun Easter pictures and your lilac close-up is beautiful! Jack looks like a totally different child. They are all growing so fast. What a wonderful family Easter day you had! Happy Easter Nancy~ I am amazed too how fast Jack has grown! They are all so darling!